My relationship with the Mimosa I think can be summed up as love/hate, though not in the way you’re thinking. You see, I deeply love Mimosas. Yet, at the same time, I hate telling people that. That statement conjures images of accessories such as small dogs and man bags. Well, I call BS on that. 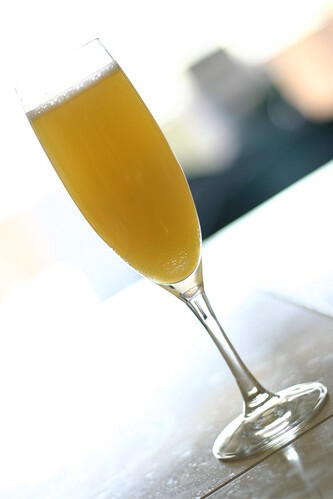 The Mimosa is a damn fine cocktail and, like other “not-so-manly” mixes that I’ve tasted in the past, it deserves respect. But, since I’m running on a compressed schedule this week because I’m sampling a few cocktails I kept this round of experimentation brief. Let’s get started with the recipe from Regan’s Joy of Mixology. I mixed it, I photographed it, I sampled it and then, as per my usual, I wanted to tweak it. As written the recipe is good, but it’s too sweet for my taste. Regan mandates that the triple sec is absolute required. I say nay. The triple sec doesn’t really add much to the flavor profile (it’s just another layer of orange). What it does add is additional sweetness. I prefer a drier Mimosa, so my choice was clear, drop the triple sec and move on. One last point to make before I move on to brunches unknown. Champagne, or more correctly sparkling wine, is key to this drink. There’s a strong pull with these types of drinks to pour in crap wine and call it good. Don’t do it! Seriously! No, you don’t need to be topping your orange juice with Kristal either, but you should use something you’re willing to drink on its own. It’s like when you’re cooking with wine. Always cook with something drinkable, always mix with something drinkable. So there you have it. Now, go forth and spread the joy of the Mimosa. Good call, although orange flower water has a more floral flavor than orange flavor. I think orange bitters might be a better choice as they’d punch up the orange flavor, but minimalize the sweetness.